A hayfever vaccine could be available to patients in three years, after being shown to fight off the condition during pollen season. 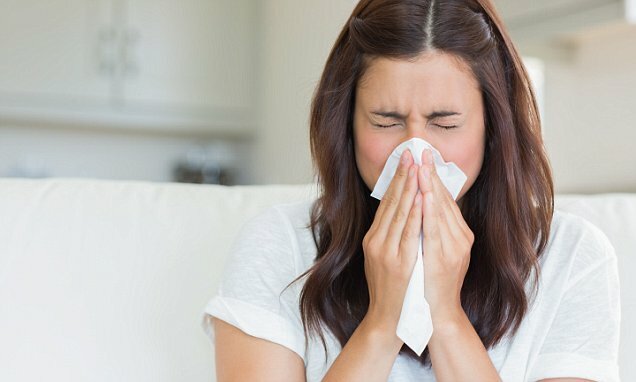 A synthetic version of grass pollen has been created by scientists, which cuts wheezing, itchy eyes and medication use by 25 per cent. Researchers say they believe just three injections a year could leave people with hayfever entirely symptom-free. At least a quarter of people in Britain, or up to 18 million, suffer from hayfever, which causes misery between the months of April and June. The latest research, led by the Medical University of Vienna, shows the newly created vaccine cut symptoms by a quarter in two years. A further unpublished study is claimed to have slashed symptoms by up to 60 per cent in some people after a year. A larger study of adults and children is planned for next year, and Dr Rudolf Valenta, who led the vaccine development, said the drug could be available in chemists as early as 2021. Dr Valenta, head of immunopathology at the Medical University of Vienna, said: ‘My expectation is that the vaccine will lead to an almost complete relief of symptoms after two or three years after injections. ‘People will be able to defend themselves from grass pollen using their own immune system, without having to take expensive anti-inflammatory drugs which may weaken their immune system and make them tired during the day. The study, published in the Journal of Allergy and Clinical Immunology, is for hayfever triggered by grass pollen. But the research team hope their treatment could also be used in people allergic to cats, dust mites and ragweed pollen.